In QuickBooks 2015, you can track invoices by customer or by customer and job. This may sound kooky, but some businesses invoice customers (perhaps several times) for specific jobs. Take the case of a construction subcontractor who does foundation work for a handful of builders of single-family homes. This construction subcontractor probably invoices his customers by job, and he invoices each customer several times for the same job. For example, he invoices Poverty Rock Builders for the foundation job at 1113 Birch Street when he pours the footing and then again when he lays the block. At 1028 Fairview, the same foundation job takes more than one invoice, too. Right-click the customer for whom you want to set up a job, choose Add Job from the contextual menu that appears, and click the Add Job tab. QuickBooks displays the New Job window. You use this window to describe the job. A great deal of the information in this window appears on the invoice. The cursor is in the Job Name text box. Just type the name of the job or project. (Optional) If you’re tracking the customer’s balances by job, enter the job’s opening balance. Move the cursor to the Opening Balance text box and type the total amount owed by the customer on the job you’re describing on the conversion date. On the off chance that you selected the wrong customer in Step 2, take a peek at the Customer drop-down list. Does it name the correct customer? If not, activate the drop-down list and select the correct customer. (Optional) Name your contact and fill in other relevant information. You can enter the name of your contact and alternative contact in the Full Name text boxes. 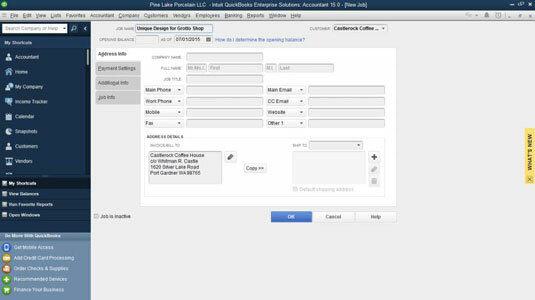 QuickBooks fills in the Contact text box for you. You probably don’t need to be told this, but fill in the Phone, Fax, Email, and website text boxes just so that you have that information on hand. Enter the job’s billing address. You can use the Bill To text box to provide the customer’s job billing address. Because chances are good that the job billing address is the same as the customer billing address, QuickBooks copies the billing address from the Customer list. But if need be, make changes. Select the Ship To address. You can use the Ship To text box to provide the job’s shipping address. Click the Copy button if the shipping address is the same as the Bill To address. Click the Payment Settings tab and describe the customer’s payment arrangements. Using the Payment Settings tab, for example, you can record an account number and preferred payment method. You can set the customer’s credit limit by using the Credit Limit box. And you can store credit card payment information for customers who want you to keep their card numbers on file. (Massively optional) Click the Additional Info tab and categorize the job. You can use the Customer Type drop-down list to give the job type. The only initial types in the default list are From Advertisement, Referral, Retail, and Wholesale. You can create other types by choosing Add New from the Customer Type drop-down list (so that QuickBooks displays the New Customer Type dialog box) and then filling in the blanks. (Optional) Click the Job Info tab and add specific job information. You can use the Job Status drop-down list in the Job Info Tab to choose None, Pending, Awarded, In Progress, Closed, or Not Awarded, whichever is most appropriate. The Start Date is, obviously, the day you start the job. As anyone knows, the Projected End and the End Date aren’t necessarily the same. Don’t fill in the End Date until the job is actually finished. Save the job information by clicking OK or Next. After you finish describing the job, you have two options: You can click OK to add the job to the list and return to the Customer Center window, or you can click Next to add the job to the list and keep the New Job window onscreen so that you can add more jobs. You can edit job information the same way that you edit customer information. Display the Customer Center window by choosing Customer→Customer Center. When QuickBooks displays the window, double-click the job and make the changes in the Edit Job window that appears. To add a large number of customers or jobs to the Customers list at the same time, display the Customer Center window, click the New Customer & Job button, and then choose the Add Multiple Customer: Jobs option. QuickBooks displays the Add/Edit Multiple List Entries worksheet, which lets you collect and edit all the same information that the regular Customers & Jobs windows do. You can also inactivate an employee from your list if it starts to get cluttered with names of employees who no longer work for you. You should wait to inactivate them until after the year is finished and the W-2 forms have been printed.